positive progression in its entirety to encourage people to not only shop in Ipswich, but to stay and experience what it has to offer. As reported during our interview with Terry Hunt - chair of the Ipswich Vision - back in May, shoppers spending just one hour longer in the town – whether that be on retail, restaurants or entertainment – is worth an extra £26million per year to the local economy. So, how do we get there? One of the most high-profile changes of late, is of course the Cornhill (see page 11). The redevelopment of this previously mediocre space is set to provide a huge boost to the area, but will inevitably become part of normal life whilst the ‘next big thing’ is mulled over by residents and the public sector alike. Steve Walker, Director of Allies & Morrison – the firm responsible for huge headline-grabbing projects such as the Kings Cross development and the London 2012 Olympics masterplan that saw Stratford transformed from dull to desirable – has pitched several big plans for how they see Ipswich transforming over the next couple of decades. A&M’s starting focus for these ideas was looking at the history and the ‘why’ of Ipswich’s existence: its maritime location. The longest continuously inhabited town in Britain, Ipswich has been long-established as a cultural and mercantile gateway to Europe. Whilst being viewed as ‘out in the sticks’ by many – due to its semi-rural Suffolk location and minor road links – Ipswich actually lends itself to a vast opportunity of European trade thanks to its strategic coastal location. A&M took these points into consideration when putting forward their proposed ideas – and the results have been quite stirring! One of their main focuses of improvement is the current gyratory [one-way] system around College Street and Star Lane. Many residents and businesses alike will agree that this pedestrian-unfriendly area vastly splits the Waterfront from the rest of the town – making even the thought of accessing on-foot a difficulty. 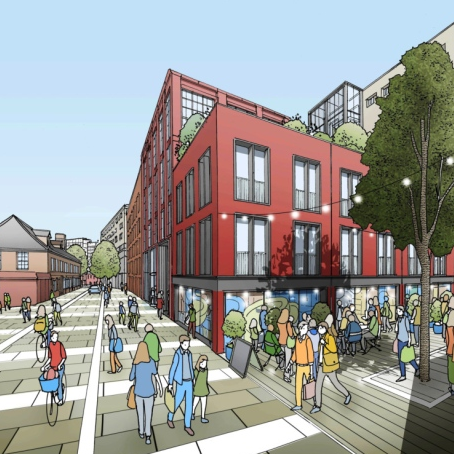 A&M suggest that making Star Lane a two-way system and turning College and Key Streets into a ‘shared space’ environment will encourage people visiting the Waterfront to also venture to the town centre – and vice versa. Showcasing the incredible architectural structuring in the St Peter’s Dock area – including Wolsey’s Gate, which currently sits sadly on the main road with little attraction to visit it – will enable this space to become a cultural and entertainment hub. Steve also noted the growing ‘business corridor’ heading from the railway station down Princes Street and beyond. This area – whilst offering excellent business potential, particularly to companies expanding from London – is separated from the rest of the Waterfront by the mostly-unused commercial riverside area between Princes Street bridge and the skate park. A&M have illustrated a beautiful riverside park feature to connect these two areas and provide a haven amidst activity for residents and visitors alike. A highly feasible option, given that it would only require a 20-40m wide space to implement. Looking closer to the town centre, Lloyds Avenue has somewhat fallen by the wayside with the Cornhill redevelopment being centre stage. The road – mainly used as a taxi rank at present – features restaurants and entertainment (including the new Three Wise Monkeys venue due to open in a few weeks) that are often overlooked due to their out-of-sight location. 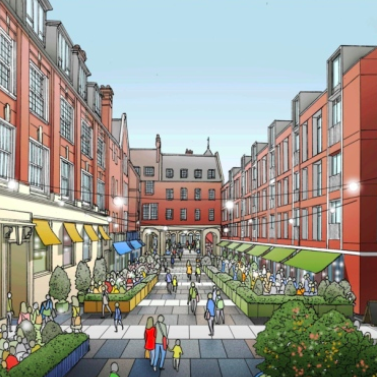 A&M’s aim is to create a ‘higher quality environment’; pedestrianising the road and allowing venues to spill out into the street to create a more boulevard-style welcoming seen in the likes of some European cities. Some great ideas to be considered over the coming years, but do A&M believe they are achievable? “These ideas are designed to be considered over a long timescale – we’re talking the next 25 years, rather than the next 3-5 years,” explains Steve. Something to look forward to with anticipation then!